The membrane-delimited and voltage-dependent inhibition of N-type Ca2+ channels is mediated by Gβγ subunits. Previously, exogenous excess GDP-bound GαoA has been shown to dramatically attenuate the norepinephrine (NE)-mediated Ca2+ current inhibition by sequestration of Gβγ subunits in rat superior cervical ganglion (SCG) neurons. In the present study, we determined whether the attenuation of NE-mediated modulation is specific to GαoA or shared by a number of closely related (Gαtr, GαoB, Gαi1, Gαi2, Gαi3, Gαz) or unrelated (Gαs, Gαq, Gα11, Gα16, Gα12, Gα13) Gα subunits. Individual Gα subunits from different subfamilies were transiently overexpressed in SCG neurons by intranuclear injection of mammalian expression vectors encoding the desired protein. Strikingly, all Gα subunits except Gαz nearly blocked basal facilitation and NE-mediated modulation. Likewise, VIP-mediated Ca2+current inhibition, which is mediated by cholera toxin-sensitive G-protein, was also completely suppressed by a number of Gα subunits overexpressed in neurons. Gαs expression produced either enhancement or attenuation of the VIP-mediated modulation—an effect that seemed to depend on the expression level. The onset of the nonhydrolyzable GTP analog, guanylylimidodiphosphate-mediated facilitation was significantly delayed by overexpression of different GDP-bound Gα subunits. Taken together, these data suggest that a wide variety of Gα subunits are capable of forming heterotrimers with endogenous Gβγ subunits mediating voltage-dependent Ca2+ channel inhibition. In conclusion, coupling specificity in signal transduction is unlikely to arise as a result of restricted Gα/Gβγ interaction. Modulation of N-type Ca2+ channels by neurotransmitters occurs via multiple pathways. The most common modulatory pathway involves activation of pertussis toxin (PTX)-sensitive heterotrimeric G-proteins, resulting in a distinct form of membrane-delimited and voltage-dependent inhibition (Hille, 1994). Recently, Gβγ subunits have been shown to mediate the voltage-dependent inhibition of Ca2+ currents (Herlitze et al., 1996; Ikeda, 1996). The idea that Gβγ subunits directly interact with Ca2+ channels has been supported by the molecular identification of potential Gβγ binding motifs on the intracellular I–II loop (De Waard et al., 1997; Zamponi et al., 1997; Furukawa et al., 1998) and C terminus (Qin et al., 1997). In addition, a recent study suggests that the N terminus of the Ca2+channel α1 subunit is also essential for the G-protein-mediated modulation (Page et al., 1998). With regard to the interaction with Ca2+ channels, there seem to be few functional differences among different Gβγ combinations. For example, the Ca2+ currents were tonically inhibited by various Gβγ combinations, including Gβ1γ2, Gβ1γ3, Gβ1γ7 (Ikeda, 1996), and Gβ2γ3 (Herlitze et al., 1996) when overexpressed in sympathetic neurons [but see Garcı́a et al. (1998)]. These observations are similar to the finding that G-protein-activated inwardly rectifying K+ (GIRK) channels were activated by different Gβγ combinations, with the exception of β1γ1 (Wickman et al., 1994). Furthermore, various Gα subunits are involved in coupling receptors to ion channels. Activation of different receptors activate GIRK channels via different Gα proteins (Lim et al., 1995; Ruiz-Velasco and Ikeda, 1998). Likewise, although Gαo appears to be dominantly coupled to receptors mediating the voltage-dependent inhibition of Ca2+ channels in neuronal tissues, Gαi (Ewald, 1989; Toselli et al., 1989) and Gαs (Zhu and Ikeda, 1994) can also participate in this pathway. Overall, these observations argue against the idea that coupling specificity resides at the Gαβγ/effector level and thus requires restricted Gα/βγ combinations. 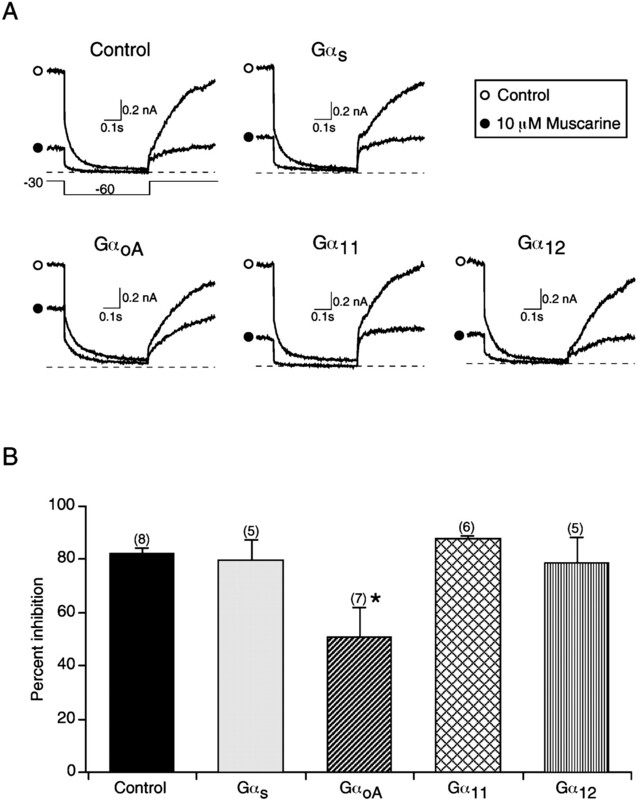 To confirm the modulatory role of Gβγ in the neurotransmitter-mediated inhibition of Ca2+channel currents, the stoichiometry between Gα and Gβγ subunits has been disrupted by overexpressing GαoA in sympathetic neurons (Ikeda, 1996). In this experiment, excess GDP-bound GαoA significantly blocked NE-mediated Ca2+ current inhibition by creating conditions favoring heterotrimer formation. 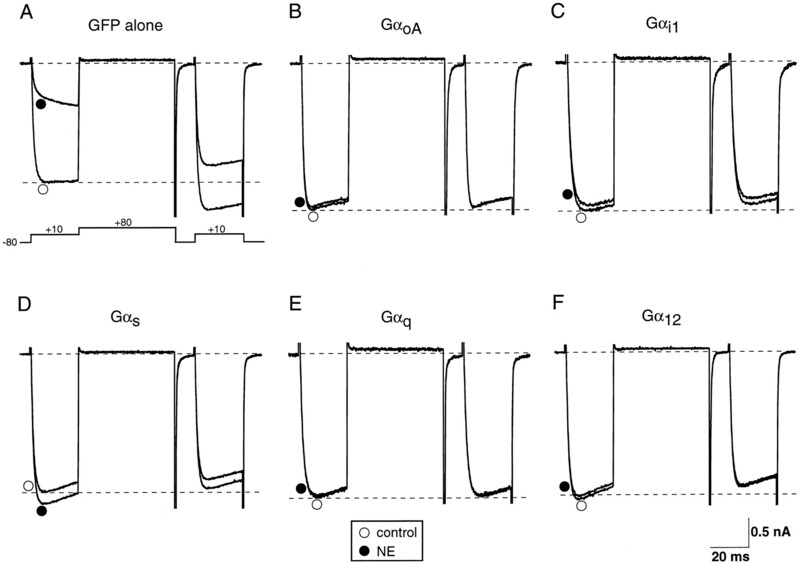 In the present study, the same strategy was used to test whether the block of norepinephrine (NE)-mediated inhibition is specific to GαoA or shared by members in the same (Gi, i.e., GαoB, Gαi1, Gαi2, Gαi3, Gαtr, and Gαz) or different Gα subfamilies (Gαs, Gαq/11, and Gα12). In superior cervical ganglion (SCG) neurons, the parallel pathways using PTX-sensitive Gαo/i and cholera toxin (CTX)-sensitive Gαs converge to the voltage-dependent modulation of Ca2+ channels (Zhu and Ikeda, 1994). Thus, a complementary set of experiments was performed to test whether VIP-mediated inhibition is blocked by overexpression of the Gα subunits described above. Our data showed that a wide variety of Gα subunits can interact with the Gβγ subunits involved in NE-, VIP-, and guanylylimidodiphosphate [Gpp(NH)p]-mediated current inhibition. These results suggest that coupling specificity is unlikely to arise as a result of restricted Gα/βγ interactions. Some preliminary data have been published previously in abstract form (Jeong and Ikeda, 1997). Vectors and chemicals. The clones for G-protein GαoA, GαoB, Gαq, Gα11, Gα16, Gα12, and Gα13 were generously provided by Dr. M. I. Simon (California Institute of Technology). The clones for Gαs and Gαi1-i3 were kind gifts from Dr. R. Reed (Johns Hopkins Medical School). The clone for the wild-type Gαz was a generous gift from Dr. H. R. Bourne (University of California San Francisco). The pEGFP-N1 N-terminal fusion vector was purchased from Clontech Laboratories (Palo Alto, CA). The vectors were propagated in either XL-1 Blue or MC1061/p3Escherichia coli, (Stratagene, Cambridge, UK) as appropriate, and purified using Qiagen (Chatsworth, CA) miniprep or maxiprep columns. Chemicals used in experiments were obtained as follows: Gpp(NH)p and NE from Sigma (St. Louis, MO); VIP from Bachem (Torrance, CA). Dissociation of SCG neurons. SCG neurons were enzymatically dissociated as described previously (Ikeda, 1991; Zhu and Ikeda, 1993). Briefly, adult (200–350 gm) male Wistar rats were decapitated using a laboratory guillotine. The SCG were dissected free of the carotid bifurcation and placed in cold (4°C) HBSS. The ganglia were desheathed, cut into small pieces, and incubated with 1 mg/ml collagenase type D, 0.35 mg/ml trypsin (Boehringer Mannheim Biochemicals, Indianapolis, IN), and 0.1 mg/ml DNase type I (Sigma) in 10 ml of modified Earle’s balance salt solution (EBSS, pH 7.4) in a 25 cm2 tissue culture flask. The EBSS was modified by adding 3.6 gm/l glucose and 10 mm HEPES. The flask was then placed in a shaking water bath at 35°C for 1 hr. After incubation, neurons were dissociated by vigorous shaking of the flask. After centrifugation at 50 × g for 5 min, the dispersed neurons were resuspended in MEM containing 10% fetal calf serum, 1% glutamine, and 1% penicillin–streptomycin solution (all from Life Technologies, Grand Island, NY). Neurons were then plated onto polystyrene culture dishes (35 mm) coated with poly-d-lysine and maintained in the humidified atmosphere of a 95% air–5% CO2 incubator at 37°C. All neurons were used within 24 hr after intranuclear injection of vectors. Intranuclear injection of vectors. Vectors encoding particular proteins were directly injected into the nucleus of SCG neurons as described previously (Ikeda, 1996, 1997). Briefly, the cDNAs from stock solutions (∼1.0 μg/μl) were diluted in TE buffer (10 mm Tris, 1 mm EDTA, pH 7.4) to a final concentration of 100 ng/μl (per subunit). A reporter vector (pEGFP-N1) encoding a double mutant (F64L:S65T) variant of the green fluorescent protein (GFP) was also included (5 ng/μl) to facilitate later identification of neurons receiving a successful nuclear injection. After centrifugation (16,000 × g for 20 min) to remove undissolved particles, the cDNA-containing solution was loaded into a fine borosilicate micropipette and injected into the nucleus of SCG neurons with an Eppendorf 5242 microinjector and 5171 micromanipulator system (Madison, WI) using injection pressure and duration of 120–200 hPa and 0.3 sec, respectively. Neurons successfully expressing particular proteins were easily identified 14–24 hr later by the observation of the fluorescence produced by the GFP under an inverted microscope (Diaphot, Nikon, Japan) equipped with an epifluorescence unit (B-2A filter cube, Nikon). Electrophysiology. A culture dish containing dissociated SCG neurons was placed on an inverted phase–contrast microscope (Nikon) and superfused at a flow rate of 1–2 ml/min with an external solution as described below. Ionic currents were recorded using a whole-cell variant of the patch-clamp technique (Hamill et al., 1981) as described previously (Ikeda, 1991; Ikeda et al., 1995). Patch electrodes were fabricated from a borosilicate glass capillary (1.65 mm outer diameter, 1.2 mm inner diameter; Corning 7052, Garner Glass Co. Claremont, CA). The patch electrodes were coated with Sylgard 184 (Dow Corning, Midland, MI) and fire-polished on a microforge, and they had resistances of 1.5–2.5 MΩ when filled with an internal solution described below. The bath was grounded by an Ag/AgCl pellet connected via a 0.15 m NaCl/agar bridge. The cell membrane capacitance and series resistance were always compensated (typically >80%) electronically using a patch-clamp amplifier (Axopatch-200; Axon Instruments, Foster City, CA). Voltage protocol generation and data acquisition were performed using custom data acquisition software on a Macintosh Quadra series computer equipped with a MacAdios II data acquisition board (G. W. Instruments, Somerville, MA). Current traces were generally low-pass-filtered at 5 KHz using the four-pole Bessel filter in the clamp amplifier, digitized at 2–5 kHz, and stored on the computer hard drive for later analysis. Ca2+current traces were corrected for linear leakage current as determined from hyperpolarizing pulses. All experiments were performed at room temperature (21–24°C). Drugs were applied to single neurons via a gravity-fed fused silica capillary tube connected to an array of seven polyethylene tubes. The outlet of the perfusion system was located within 100 μm of the cell. Drug application was started by switching the control external solution to a drug solution. Data were presented as means ± SEM. ANOVA followed by post hoc Dunnett’s test, as appropriate, were performed to determine statistical significance. p < 0.05 was considered significant. Solutions. For Ca2+ current recording, the external solution contained (in mm): 145 tetraethylammonium (TEA)-methanesulfonate (MS), 10 HEPES, 10 CaCl2, 15 glucose, 0.0001 tetrodotoxin (TTX) (pH adjusted to 7.4 with TEA-OH, osmolality 318 mOsm/kg H2O). Patch pipette contained (in mm) 120N-methyl-d-glucamine (NMG)-MS, 20 TEA-MS, 20 HCl, 11 EGTA, 1 CaCl2, 10 HEPES, 4 MgATP, 0.3 Na2GTP, 14 creatine phosphate (pH adjusted to 7.2 with TEA-MS, osmolality 297 mOsm/kg H2O). In experiments designed to activate the overexpressed Gα subunits, 0.5 mm Gpp(NH)p was included in the internal solution. For M-type K+ channel current (M-current) measurement, the external solution contained (in mm): 150 NaCl, 2.5 KCl, 10 HEPES, 1 MgCl2, 2 CaCl2, and 15 glucose (pH adjusted to 7.4 with NaOH, osmolality 320 mOsm/kg H2O). The internal solution contained (in mm): 150 KCl, 0.1 K4BAPTA, 10 HEPES, 4 MgATP, and 0.1 Na2GTP (pH adjusted to 7.2 with KOH, osmolality 300 mOsm/kg H2O). We first determined whether different Gα subunits are able to interact with the Gβγ subunits released on activation of α2-adrenergic receptors (α2-ARs). To address this question, Gα subunits from different subfamilies were transiently overexpressed in SCG neurons by intranuclear injection of mammalian expression vectors encoding the desired proteins. Figure1 illustrates typical whole-cell Ca2+ current records obtained in the absence or presence of 10 μm NE from SCG neurons previously injected with selected subunits from four Gα-subfamilies. The Ca2+ currents were evoked by a double-pulse protocol consisting of two identical test pulses to +10 mV separated by a large depolarizing conditioning pulse to +80 mV (Fig. 1A). From the current traces, we measured facilitation of Ca2+ currents in the absence of agonist (basal facilitation) as well as percent inhibition of Ca2+currents produced by the agonist. Facilitation was defined as the ratio of the postpulse to prepulse current amplitude measured isochronally at 10 msec after the start of the test pulse. In the control neuron, expressing only GFP, Ca2+ currents were tonically facilitated (∼1.24) by the strong conditioning pulse in the absence of agonist (Fig. 1A). Previously, basal facilitation in SCG neurons has been shown to arise from a small degree of tonic G-protein activation (Ikeda, 1991). Application of 10 μmNE produced a typical voltage-dependent inhibition of Ca2+ currents characterized by kinetic slowing and an increased prepulse facilitation (from 1.24 to 2.84) (Elmslie et al., 1990). Expression of GFP had little effect on the magnitude of either basal facilitation or NE-mediated Ca2+ current inhibition (1.28 ± 0.02, n = 19 and 57 ± 2%, n = 15, respectively, for uninjected neurons; 1.32 ± 0.02, n = 39 and 61 ± 2%,n = 30, respectively, for injected neurons) (Fig.2A,B). In contrast, basal facilitation was absent after overexpression of Gα subunits. In addition, a slight inactivation was evident after the large depolarizing conditioning pulse (Figs. 1B–F,2A). These results are consistent with the sequestration of endogenous free Gβγ by overexpressed GDP-bound Gα subunits. As shown previously (Ikeda, 1996), the injection of the cDNA encoding for GαoA nearly abolished NE-mediated Ca2+ current inhibition (Fig. 1B). Likewise, another PTX-sensitive Gα, Gαi1, was able to disrupt the NE-mediated modulation when overexpressed (Fig.1C). Strikingly, overexpression of other Gα-subfamily members, including Gαs, Gαq, and Gα12, produced effects similar to those by GαoA and Gαi1 (Fig.1D–F). Figure 2B summarizes the effects of overexpressing various Gα subunits on NE-mediated Ca2+ current inhibition. With the exception of Gαz, all tested Gα subunits nearly abolished NE-mediated modulation (Fig. 2B). In neurons overexpressing Gαz, the NE-mediated modulation was not significantly different from that of control neurons (p > 0.05, n = 8). Previously, we have shown that Gαz substitutes for Gαo/i by coupling to Gαo/i-coupled receptors, including α2-ARs (Jeong and Ikeda, 1998). Taken together, these data suggest that various GDP-bound Gα subunits sequester Gβγs released on receptor activation and prevent the NE-mediated Ca2+ current inhibition. Heterologous overexpression of different Gα subunits abolished NE-mediated Ca2+ currents in SCG neurons. Superimposed current traces were recorded in the absence (○) or presence (●) of 10 μm NE from neurons transiently expressing GFP alone (A), GαoA(B), Gαi1(C), Gαs (D), Gαq (E), and Gα12(F). The Ca2+ currents were evoked by a double-pulse protocol consisting of two identical test pulses to +10 mV from a holding potential of −80 mV separated by a large depolarizing conditioning pulse to +80 mV (insetin A). Note that the basal facilitation in the absence of NE was seen in control neurons (by the bottom dotted line) and abolished by the overexpression of Gα subunits. Summary of the effects of different Gα subunits on basal facilitation in the absence of agonist (A) and percentage inhibition in the presence of 10 μm NE (B) and VIP (C). Data are presented as mean ± SEM, andnumbers in parentheses indicate the number of neurons tested. VIP has been shown to produce membrane-delimited and voltage-dependent inhibition of Ca2+ currents virtually identical to that seen with α2-AR stimulation in SCG neurons (Zhu and Ikeda, 1994; Ehrlich and Elmslie, 1995). However, the modulation pathway used by VIP apparently uses a cholera toxin-sensitive G-protein, Gαs, instead of Gαo/i. Thus, we determined the ability of individual Gα subunits to attenuate VIP-mediated Ca2+current inhibition when overexpressed in SCG neurons. Figure2C summarizes the effects of overexpression of various Gα subunits on VIP-mediated Ca2+ current inhibition. In uninjected (n = 8) and GFP-injected neurons (n = 15), the mean percent inhibition produced by 10 μm VIP was 47 ± 3% and 44 ± 2%, respectively. However, in neurons expressing members of subfamilies unrelated to Gαs, i.e., Gαi, Gαq, and Gα12, the VIP-mediated Ca2+ current inhibition was nearly abolished. Gαz did not reconstitute the VIP response confirming its specificity for Go/Gi-coupled receptors (Jeong and Ikeda, 1998). When Gαs was overexpressed, the VIP responses were variable and categorized into two groups by correlating NE responses tested in the same neurons. In one group, in which the NE response was minimally affected by overexpression of Gαs, the VIP response was significantly enhanced when compared with that in control neurons (44 ± 2%,n = 15 for GFP control vs 59 ± 2%,n = 8 for Gαs, p< 0.05). In another group, in which the NE response was completely blocked, however, overexpression of Gαs significantly attenuated the VIP-mediated Ca2+ current inhibition (44 ± 2%, n = 15 for GFP control vs 29 ± 4%, n = 4 for Gαs). When two groups of data were pooled, VIP produced 49 ± 5% (n = 12) inhibition, similar to the control value in neurons expressing Gαs (Fig. 2C). Because all Gα subunits that were tested produced positive effects, we did not confirm the expression of proteins using immunochemical techniques. Instead, we tested whether the heterologously expressed Gα subunits had nonspecific effects on Ca2+ current modulation. In sympathetic neurons, inhibition of M-current has been shown to be mediated by the α subunit rather than the βγ subunits of the Gqheterotrimer (Haley et al., 1998; Kammermeier and Ikeda, 1999). Thus, as a negative control for the specific effects of Gα subunits in sequestering Gβγ subunits, the muscarinic modulation of M-current was assessed in SCG neurons expressing different Gα subunits, including GαS, GαoAGα11, and Gα12. The deactivation of M-current was evoked by a test pulse to −60 mV for 0.5 sec from a holding potential of −30 mV (Fig.3A). In a control neuron expressing GFP, 10 μm muscarine produced a significant inhibition of the M-current (Fig. 3A). Overexpression of GαS, Gα11, and Gα12 subunits did not affect the muscarinic inhibition of the M-currents (Fig. 3A). In contrast, M-current inhibition was partially but significantly attenuated in neurons expressing GαoA (p < 0.05). As summarized in Figure 3B, 10 μm muscarine inhibited the M-current by 83 ± 2% (n = 8) in control neurons, and by 80 ± 8% (n = 5), 52 ± 11% (n = 7), 88 ± 1% (n = 6), and 79 ± 10% (n = 5), respectively, in neurons expressing GαS, GαoA, Gα11, and Gα12 subunits. Conversely, overexpression of Gαq(Q209L), a GTPase-deficient and constitutively active form of Gαq subunit, virtually eliminated the M-current and thereby the muscarinic modulation (n = 4; data not shown), consistent with a previous finding (Haley et al., 1998). Taken together, these data suggest that the overexpressed α subunits interact with Gβγ subunits rather than nonspecific interaction with α2-ARs, Ca2+ channels, or other signaling proteins to block the modulation of Ca2+ currents. Overexpression of the GαoA subunit has been shown to significantly delay Gpp(NH)p-mediated facilitation in SCG neurons (Ikeda, 1996). The delay is thought to arise from the ability of Gpp(NH)p, a nonhydrolyzable GTP analog, to irreversibly activate Gα subunits, thereby overcoming the sequestration of Gβγ produced by overexpression of GαoA. Thus, we tested whether different Gα subunits could delay the Gpp(NH)p-mediated facilitation when overexpressed in SCG neurons. 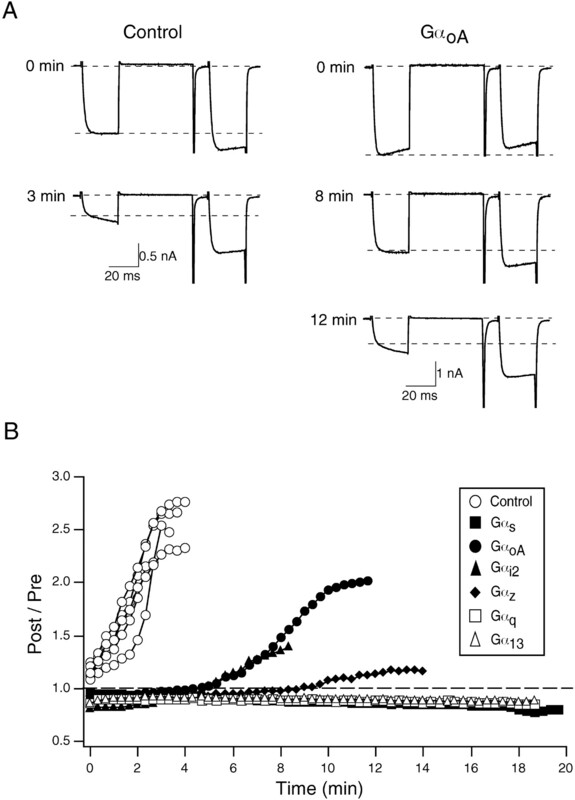 When uninjected control neurons were dialyzed with 0.5 mm Gpp(NH)p, the mean facilitation was increased from 1.16 ± 0.03 to 2.51 ± 0.11 (n = 6) within 4 min (Fig.4). However, the onset of Gpp(NH)p-mediated facilitation was significantly delayed by overexpression of GαoA (n = 6). Likewise, another PTX-sensitive member of the Gi subfamily, Gαi2, exerted a similar effect on the Gpp(NH)p-mediated facilitation (n = 2) (Fig.4B). When PTX-insensitive Gα subunits such as Gαs(n = 5), Gαz(n = 4), Gαq(n = 5), and Gα13 (n = 5) were overexpressed, the onset of facilitation by the dialysis of Gpp(NH)p was nearly blocked. Heterologous overexpression of different Gα subunits significantly delayed Gpp(NH)p-mediated facilitation in SCG neurons. A, Representative Ca2+current traces showing time-dependent change of facilitation in control (left panel) and GαoA-injected (right panel) neurons. In both cases, 0.5 mm Gpp(NH)p was present in patch pipettes.B, time course of Gpp(NH)p-mediated facilitation in neurons expressing Gαs, GαoA, Gαi2, Gαz, Gαq, and Gα13. The dotted line in B indicates the absence of facilitation. One experimental way to affirm Gβγ-mediated signaling is to increase the normal Gα/Gβγ ratio by overexpressing Gα subunits. Excess GDP-bound Gα, with a high affinity for Gβγ subunits, may create conditions favoring heterotrimer formation and thus produce a “Gβγ sink” (Slepak et al., 1995). Suppression of Gβγ-mediated signaling by exogenous GDP-bound Gαo has been demonstrated for different effectors such as adenylyl cyclase (Federman et al., 1992), GIRK channels (Ito et al., 1992; Reuveny et al., 1994; Krapivinsky et al., 1995),), phospholipase Cβ (Katz et al., 1992), and phosphoinositide 3 kinase (Stephens et al., 1994). Likewise, in SCG neurons, overexpression of GDP-bound GαoA has been shown to eliminate NE-mediated Ca2+ current inhibition (Ikeda, 1996). A biochemical study in which ADP-ribosylation by PTX and GTPase activity were measured has demonstrated that recombinant Gα subunits (Gαs, Gαi1, Gαi2, and Gαo) were able to form heterotrimers with different Gβγ subunits (Ueda et al., 1994). Recently, analysis of immunoprecipitation combined with silver stain and immunoblotting has also demonstrated the random association of Gα subunits with different Gβγ subunits from tissue and cell extracts (Ueda et al., 1998). In addition, another in vitroexperiment has shown the ability of five Gα subunits (Gαi1, Gαi2, Gαo, Gαs, and Gαq) to associate with Gβ subunits (β1 and β2) (Fletcher et al., 1998). On the basis of these in vitro experiments, the interaction between Gα and Gβγ subunits seems to display little specificity. However, an apparent exception to this pattern is the structurally divergent Gβ5 subunit that appears to demonstrate specificity for Gαq (Fletcher et al., 1998). To date, it is unclear whether the nonspecific interaction between Gα and Gβγ subunits occurs in native systems. In the present study, we showed that the suppression of the NE-mediated Ca2+ current inhibition occurred with nearly all Gα subunits, regardless of Gα subfamily (Gαs, Gαo/i, Gαq, and Gα12). Interestingly, overexpression of different Gα subunits also eliminated the current inhibition mediated by cholera toxin-sensitive Gαs activated on VIP receptor activation (Zhu and Ikeda, 1994). In addition, overexpression of GDP-bound Gα subunits significantly delayed the Gpp(NH)p-mediated modulation. Thus, the exogenous GDP-bound Gα seems to interact with Gβγ subunits released from many different endogenous heterotrimers (e.g., Gαsβγ and Gαo/iβγ). This result might not be surprising given the molecular similarity (80–90% identical in sequence) of the known Gβ subunits (except β5) (Watson et al., 1994) and the results ofin vitro experiments. It is likely that all effective Gα subunits suppress the current modulation by sequestration of Gβγ subunits because M-current modulation (selected as a negative control), which is mediated by Gαq (Haley et al., 1998), was not abolished by overexpression of Gα subunits. This explanation is also supported by the fact that the NE-mediated Ca2+current inhibition was intact when Gαo was coexpressed with Gβγ subunits (Jeong et al., 1998). Unexpectedly, M-current modulation was partially attenuated when GαoA was overexpressed in SCG neurons. This phenomenon remains to be investigated. However, it is possible that an extremely high level of GDP-bound Gαo absorbs the Gβγ subunits from Gq heterotrimers coupled to receptors or alters the signaling pathway for M-current modulation by unknown mechanisms. For the modulation by either NE or VIP there was an exception; that is, NE- and VIP-mediated modulation was not eliminated by overexpression of Gαz and Gαs, respectively. Additional experiments showed that Gαz was able to reconstitute the voltage-dependent inhibition of Ca2+ currents by different Go/Gi-coupled receptors when overexpressed in SCG neurons (Jeong and Ikeda, 1998). 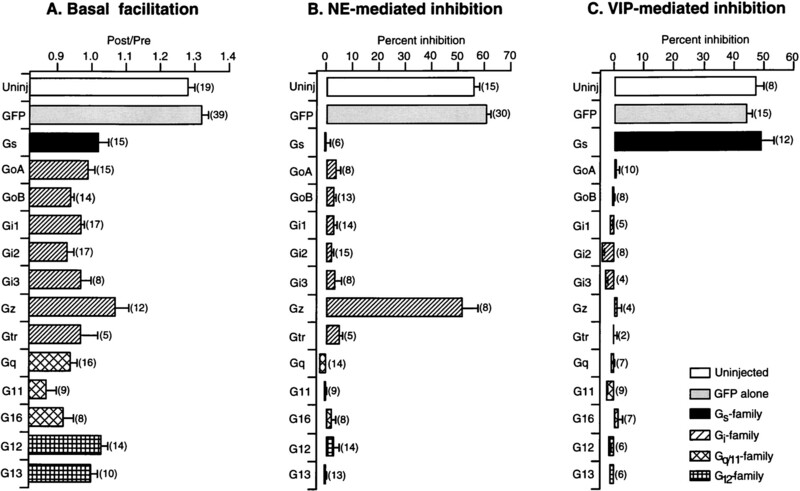 Gαzdid not reconstitute the VIP-mediated current inhibition because of lack of coupling to VIP receptors but was able to interact with the Gβγ responsible for VIP-mediated inhibition. It is unclear how Gαz replaces endogenous Gαo/isubunits in neurons. However, the reconstitution of NE-mediated current inhibition by Gαz can be blocked by the extremely high expression of Gαz (data not shown). When Gαs was overexpressed, we acquired two different groups of results: (1) the enhancement or (2) the attenuation in VIP-mediated modulation in comparison to control. These dual effects can be explained as follows. When the expression level was high (as indirectly judged by block of NE response in the same tested neurons), excess GDP-bound Gαs acted as Gβγ sinks to reduce VIP-mediated inhibition. Conversely, when the expression level was low (as indirectly judged by the unaltered NE response in the same tested neurons), Gαs was capable of forming heterotrimer complexes (Gαsβγ) with endogenous free Gβγ subunits (decreasing basal facilitation), and subsequently coupled to receptors. This is consistent with findings that expression of exogenous Gαs proteins at a low level results in the enhanced modulation by increasing the number of receptor–Gαs complexes (Bertin et al., 1994; Lim et al., 1995; Krumins and Barber, 1997). Studies using non-neuronal heterologous expression systems have generated similar results, i.e., expression of Gα subunits decreased the basal facilitation and increased G-protein-mediated modulation (Bourinet et al., 1996; Roche and Treistman, 1998). Thus, whether a certain exogenous Gα subunit increases or blocks receptor-mediated current modulation seems to be determined by specificity to a certain receptor and/or expression level of the subunit in the tested cells. Consequently, the question arises as to whether exogenous expression of Gαo might enhance the NE-mediated Ca2+ current inhibition in SCG neurons. Unlike the voltage-dependent modulation of Ca2+ channels by Gαs-coupled receptors (e.g., VIP response), the NE-mediated response appears saturated at maximal concentrations of agonist. This notion is supported by experiments in which the voltage-dependent inhibition of Ca2+ currents was unchanged after application of both VIP and α2-AR agonists together when compared with application of α2-AR agonist alone (Zhu and Ikeda, 1994;Ehrlich and Elmslie, 1995). Thus, it seems unlikely that exogenous Gαo expressed at low levels would enhance the NE response even after heterotrimer formation with endogenous Gβγ (Herlitz et al., 1996). The ability of heterologously expressed Gα subunits to delay the onset of Ca2+ current modulation (Fig. 4) is consistent with the notion of Gβγ buffering. The delay can be rationalized by assuming that basal GDP–GTP exchange results in the binding of Gpp(NH)p to both endogenous and heterologously expressed Gα subunits. Because Gpp(NH)p cannot be hydrolyzed, the majority of Gα subunits eventually attain the Gpp(NH)p bound state and are thus incapable of binding Gβγ with high affinity. Consequently, the eventual loss of Gα-GDP results in “release” of free Gβγ and thus voltage-dependent modulation. What is not clear from these data is why Gαs and Gαz produce such a dramatic effect in this assay when compared with their weak ability to attenuate agonist-mediated modulation (Fig. 2). Although we have no definitive explanation for these results, it can be speculated that expression levels, intrinsic GDP–GTP (or Gpp(NH)p) exchange rates (Fields and Casey, 1997), or compartmentalization (Neubig, 1994) may underlie these findings. When compared with “Gβγ sinks” derived from effector molecules, for example the C terminus of βARK (Koch et al., 1994) or the QEHA peptide (Chen et al., 1995), Gα subunits may prove advantageous in regard to probing signaling pathways. First, it is assumed that Gα–GDP has a greater affinity for Gβγ than effector molecules. Although we are unaware of studies that directly compare these properties, it stands to reason that this is the case because the termination of Gβγ actions is thought to require association with Gα–GDP. If the affinity of effector molecules for Gβγ exceeded that of Gα–GDP, termination of signaling could not occur via this mechanism. Recently, a biochemical study has shown that a peptide containing the Gβγ-binding motif QXXER failed to inhibit interactions between GDP-bound Gα and Gβγ subunits (Chen et al., 1995), thus supporting this idea. Second, effectors such as βARK have been shown to interact with specific Gβγ isoforms (Koch et al., 1994), whereas Gα/Gβγ interactions appear relatively nonspecific. Thus, one would predict that overexpression of Gα–GDP would affect a broader range of Gβγ-mediated responses. It should be noted, however, that information concerning heterotrimer formation for the various G-protein subunits is incomplete. Moreover, the ability of βARK isoforms to specifically bind different Gβγ combinations may prove useful for identification purposes once these interactions are better defined. Thus, the information gained by overexpressing Gα subunits or effector molecule binding sites may prove complementary in regard to Gβγ signaling. In summary, the present study showed that a wide variety of GDP-bound Gα subunits were able to sequester the Gβγ subunits, resulting in block of NE-, VIP-, and Gpp(NH)p-mediated modulation of N-type Ca2+ channels in SCG neurons. These results suggest that coupling specificity in signal transduction is unlikely to arise as a result of restricted Gα/Gβγ interaction. Although the interaction between Gα and Gβγ subunits is relatively nonspecific, a specific heterotrimer combination may be required for selective coupling of certain receptors to Ca2+channels (for review, see Kalkbrenner et al., 1996). Thus, it is likely that the identity of Gα subunits may be one of the major determinants for the selective recognition of a given heterotrimer by a receptor. This study was supported by National Institutes of Health Grant GM 56180. We thank M. King for technical assistance and Drs. V. Ruiz-Velasco and P. Kammermeier for critical reading of an earlier version of this manuscript. We are grateful to Drs. M. I. Simon, R. Reed, and H. R. Bourne for providing cDNA clones. Correspondence should be addressed to Dr. Stephen R. Ikeda, Laboratory of Molecular Physiology, Guthrie Research Institute, One Guthrie Square, Sayre, PA 18840. (1994) Cellular signaling by an agonist-activated receptor/Gsα fusion protein. Proc Natl Acad Sci USA 91:8827–8831. (1995) A region of adenylyl cyclase 2 critical for regulation by G protein βγ subunits. Science 268:1166–1169. (1995) Neurotransmitters acting via different G proteins inhibit N-type calcium current by an identical mechanism in rat sympathetic neurons. J Neurophysiol 74:2251–2257. (1989) Differential G protein-mediated coupling of neurotransmitter receptors to Ca2+ channels in rat dorsal root ganglion neurons in vitro. Neuron 2:1185–1193. (1992) Hormonal stimulation of adenylyl cyclase through Gi-protein βγ subunits. Nature 356:159–161. (1997) Signaling functions and biochemical properties of pertussis toxin-resistant G-proteins. Biochem J 321:561–571. (1998) The G protein β5 subunit interacts selectively with the Gqα subunit. J Biol Chem 273:636–644. (1998) Differential interactions of the C terminus and the cytoplasmic I-II loop of neuronal Ca2+ channels with G-protein α and βγ subunits II. Evidence for direct binding. J Biol Chem 273:17595–17603. (1998) G-protein β-subunit specificity in the fast membrane-delimited inhibition of Ca2+ channels. J Neurosci 18:9163–9170. (1998) The α subunit of Gq contributes to muscarinic inhibition of the M-type potassium current in sympathetic neurons. J Neurosci 18:4521–4531. (1981) Improved patch-clamp techniques for high-resolution current recording from cells and cell-free membrane patches. Pflügers Arch 391:85–100. (1996) Modulation of Ca2+ channels by G-protein beta gamma subunits. Nature 380:258–262. (1994) Modulation of ion-channel function by G-protein-coupled receptors. Trends Neurosci 17:531–536. (1991) Double-pulse calcium channel current facilitation in adult rat sympathetic neurones. J Physiol (Lond) 439:181–214. (1996) Voltage-dependent modulation of N-type calcium channels by G-protein βγ subunits. Nature 380:255–258. (1997) Heterologous expression of receptors and signaling proteins in adult mammalian sympathetic neurons by microinjection. Methods Mol Biol 83:191–202. (1995) Heterologous expression of metabotropic glutamate receptors in adult rat sympathetic neurons: subtype-specific coupling to ion channels. Neuron 14:1029–1038. (1992) On the mechanism of G protein βγ subunit activation of the muscarinic K+ channel in guinea pig atrial cell membrane. J Gen Physiol 99:961–983. (1997) Overexpression of various G protein α-subunits attenuates norepinephrine-mediated modulation of N-type calcium channels in rat sympathetic neurons. Soc Neurosci Abstr 23:1183P. (1998) G Protein α subunit Gαz couples neurotransmitter receptors to ion channels in sympathetic neurons. Neuron 21:1201–1212. (1998) Pertussis toxin-insensitive mutants of G-protein, Gαo/i reconstitute voltage-dependent inhibition of calcium currents in rat sympathetic neurons. Soc Neurosci Abstr 24:1574P. (1996) Specificity of interaction between receptor and G protein: use of antisense techniques to relate G-protein subunits to function. Biochim Biophys Acta 1314:125–139. (1999) Expression of RGS2 alters the coupling of metabotropic glutamate receptor 1a (mGluR1a) to M-type K+ and N-type Ca2+ channels. Neuron 22:819–829. (1992) Subunits βγ of heterotrimeric G proteins activate β2 isoform of phospholipase C. Nature 360:686–689. (1994) Cellular expression of the carboxyl terminus of a G protein-coupled receptor kinase attenuates G beta gamma-mediated signaling. J Biol Chem 269:6193–6197. (1995) Gβγ binds directly to the G protein-gated K+ channel IKACh. J Biol Chem 270:29059–29062. (1997) Examination of the effects of increasing Gs protein on β2-adrenergic receptor, Gs, and adenylyl cyclase interactions. Biochem Pharmacol 54:61–72. (1995) A G protein-gated K+ channel is activated via β2-adrenergic receptors and Gβγ subunits in Xenopus oocytes. J Gen Physiol 105:421–439. (1994) Membrane organization in G-protein mechanisms. FASEB J 8:939–946. (1998) Identification of the amino terminus of neuronal Ca2+ channel α1 subunits α1B and α1E as an essential determinant of G-protein modulation. J Neurosci 18:4815–4824. (1997) Direct interaction of Gβγ with a C-terminal Gβγ-binding domain of the Ca2+ channel α1 subunit is responsible for channel inhibition by G protein-coupled receptors. Proc Natl Acad Sci USA 94:8866–8871. (1994) Activation of the cloned muscarinic potassium channel by G protein βγ subunits. Nature 370:143–146. (1998) Ca2+ channel β3 subunit enhances voltage-dependent relief of G-protein inhibition induced by muscarinic receptor activation and Gβγ. J Neurosci 18:4883–4890. (1998) Heterologous expression and coupling of G protein-gated inwardly rectifying K+ channels in adult rat sympathetic neurons. J Physiol (Lond) 513:761–773. (1995) Functional analysis of a dominant negative mutant of Gαi2. J Biol Chem 270:4037–4041. (1994) A novel phosphoinositide 3 kinase activity in myeloid-derived cells is activated by G protein βγ subunits. Cell 77:83–93. (1989) Direct modulation of voltage-dependent calcium channels by muscarinic activation of a pertussis toxin-sensitive G-proteins in hippocampal neurons. Pflügers Arch 415:255–261. (1998) G protein γ subunits coimmunoprecipitated with antibodies against α subunits: identification of major isoforms in cultured cells by silver stain and immunoblotting with conventional transfer procedure. J Biochem 124:1033–1037. (1994) G protein βγ subunits: simplified purification and properties of novel isoforms. J Biol Chem 269:4388–4395. (1994) A fifth member of the mammalian G-protein β-subunit family. J Biol Chem 269:22150–22156. (1994) Recombinant Gβγ activates the muscarinic-gated atrial potassium channel IKACh. Nature 368:255–257. (1993) Adenosine modulates voltage-gated Ca2+ channels in adult rat sympathetic neurons. J Neurophysiol 70:610–620. (1994) VIP inhibits N-type Ca2+ channels of sympathetic neurons via a pertussis toxin-insensitive but cholera toxin-sensitive pathway. Neuron 13:657–669.